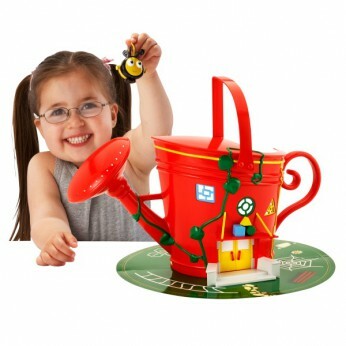 Hide Buzzbee in the head of the watering can! Fly around the classroom with the flying rail! Fold-away carrying handle. Look through the windows of the School. Use the paintbrush to paint on the White/Blackboard. Put up the children’s drawings on the walls (with stickers). Ring the school bell to start/end school! Check the time with the moving clock hands! Sit and learn with the chairs and table. Play hopscotch and other games on the cardboard play mat! Not all the contents shown are included…. This toy costs approximately £29.99 (for the latest and best prices make sure you check our retailer list for the The Hive Honeydew School above). In our review of The Hive Honeydew School we classed it as being suitable for ages 1 to 3 years, 3 years, 4 years but recommend you check the manufacturer specific advice before purchasing.